Rasam! Much have been spoken about before and much much I have also personally said about Rasam (Pepper Garlic Rasam). Rasam (Garlic Tomato Rasam). Of course. I vouch is our magical soup and one which is like a customary must have at least once a week. In fact, these days, I actually make in bulk. In other words, I make a bigger portion of rasam (Pineapple Rasam) and then, I separate into smaller portions for freezing. Time saving indeed. Rasam by the way can be kept outside because? Are we not talking about spices and our pantry friendly ingredients for rasam? We are actually (Egg Rasam). But somehow, call it my habit, I still somehow feel storing rasam in the fridge is a save bet. Of like I already told you, into individual containers and freeze. Tomato Rasam. Tomato naturally is one of the ingredients, but this my version of Tomato Rasam? The traditional (Home Rasam Podi Rasam). The handed down recipe. Grandma to mum and to me of course (Nandu/Crab Rasam). 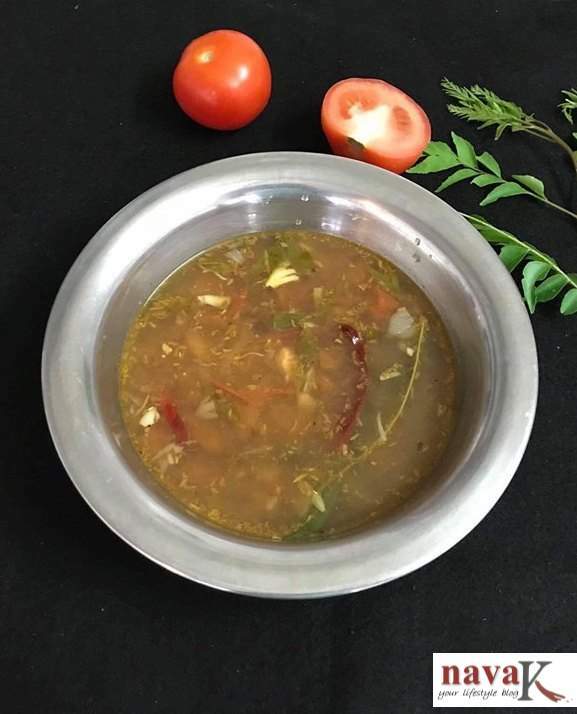 Though a tiny bit of pounding is involved, otherwise, all will be tasty, delicious and more importantly, appetizing for this Nava K's Tomato Rasam. Oh, in case you would like to try the instant version to an instant rasam (Instant Rasam), I'm attaching the video as well. Sweat/soften for a minute or two. Add mustard seeds, dried chillies and curry leaves. Cook till soft and mushy. Pour 5 cups of water. Simmer. Do not over-boil or even boil. Pour tamarind juice and add salt.